An overview of the capabilities of the program, and an understanding of how they may be applied to your circumstances. The information and instructions necessary for getting started as quickly as possible. A useful reference for the ongoing use of the program after a database has been initially created. A place where you may comment and ask any questions—and help to keep this documentation relevant and current. This Help board is a bulletin board just like the other boards hosted here. It's formatted with a theme for giving the appearance of a wiki. This means you may leave a comment or ask a question by posting a reply—just as in the other boards. Please don't worry posting in the "wrong" place. We want it to be easy for you to post when and where the comment or question arises. If moderators decide something is better discussed elsewhere, they can easily move your post. The program was installed to the Installation folder. The program executable is named viddb.exe. The folder includes sub-folders for plugins, scripts and skins. Starting the program caused a default configuration file named pvdconfig.ini to be created in the Application Data folder (XP | Vista/7). Note the hidden attribute of the Application Data folder needs to be cleared for its contents to be visible. All necessary configuration data is saved in this file—no data is saved in the Windows registry. Starting the program for the first time should cause an empty database named MOVIES.PVD to be created in the default My Documents folder (XP | Vista/7). This location and filename can be changed by specifying different values in the File>New dialog. The most effective routine is one that happens automatically. It's advisable to have some backup system in place that automatically makes a backup of all user data on a regular basis. A good backup system will keep a number of versions of each data file. By popular demand, the program includes backup and restore functions. Unfortunately, this is only effective if the program is functioning properly when the backup is made, and the same version of the program is used to restore the compressed backup file. An easier, faster and more reliable method is to make a copy of the database file in Windows Explorer. A copy will never let you down, and you'll always know exactly what state your last version was in. The following are advanced topics. "Quick start" readers may prefer to skip to Orientation now. Using -debug switch will not impact on performance. If the program is always started using the switch (e.g., by adding it to the main program shortcut), the log will always be available for monitoring and reviewing plugin performance. The purpose of the -portable switch is to allow the program to be run from a removable drive, including a memory stick. All it does is cause the configuration file to be created and saved in the Installation folder instead of the Application Data folder. If the database file is then saved to the same device, the application is completely portable. If a problem with the existing configuration file is suspected, the program can be run in portable mode to force the creation of a new default configuration file—without affecting the existing configuration file. Two different configurations can be run using the same installation—one run in portable mode, the other normally. Each configuration file could point to different database files. The second configuration could be used for testing purpose, or by a second user. An unlimited number of installations could be used on one system by ensuring each is started only in portable mode. PVD uses the Firebird RDBMS engine for it's database services. Specifically, it uses the Firebird Embedded Server, a server engine plus client rolled into one library called fbembed.dll. So while your database appears to be fully integrated with the program, it's actually an independent database served to the application by Firebird. Kroozbox media player for NMT (e.g., Popcorn Hour; see this discussion for details and instructions). Anyone connecting via the Internet (e.g., you—at the office). Firebird Server is no less efficient and does not require significantly more resources than Embedded. So if you have any need for it, use it. Once installed, you may connect to your database using either method. In most situations, it's best to always connect using the Server. Embedded will cause the database to be locked—and other users/applications will be unable to connect. For those using Firebird Server, there is one circumstance in which you must switch to Embedded. That is when running Tools>Optimization. The "garbage collection" part of that routine cannot be completed because the Server is unable to backup and restore the database. 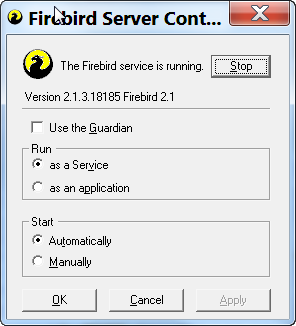 Download and install Firebird Server. Choose "Windows executable installer for full Classic or Superserver, recommended for first-time users," and either 32 or 64-bit—as appropriate for your system. In normal circumstances, you should not be concerned about studying it's documentation or changing the default configuration. Start the Firebird Server Manager. Once you are satisfied it's working correctly (step 4), we recommend you set it as shown, click OK—and forget about it. It will run as a Service, and always be available to PVD (and other applications). In PVD, select File>Open and select a file other than your active database. The point of this step is to force Firebird Embedded to release your active database so Server may connect to it. If necessary, use File>New to create an empty or test database for this purpose. Success will be indicated by this connection string (followed by "Network") appearing in the Title Bar.